I have finished another painting that I call Gypsy. 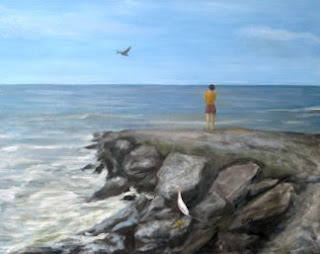 It is primarily executed in painting knife for a heavy impasto effect. I like to use the knife for a couple of reasons; it reduces my tendency to obsess over details, and it keeps the colors fresh. Several years ago, I had the opportunity to visit Santa Fe, NM on business. I was amazed at the intensity of the Flamenco dancers and especially the guitarists. I have wanted to capture that frenzy of sound and motion on canvas ever since. This is my latest painting, which was completed a couple of weeks ago. 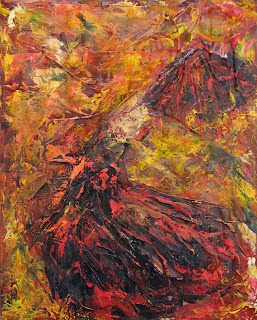 I am currently working on two new paintings; an abstract image of a flamenco dancer, and a painting of the torso Ishtar. I continue to be drawn to images from my Catholic tradition, and plan to execute a series of paintings depicting these themes.